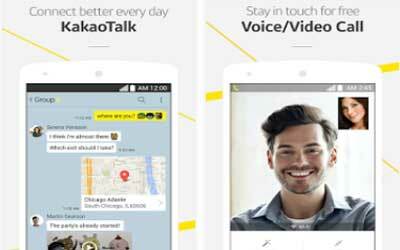 You can use KakaoTalk APK 5.7.6 to get connected with a lot of people all over the world. This application can be used to contact many people and your friends who live overseas. Once you have profile, you can be found by others using username. Not only sending messages in group, but KakaoTalk also allows you to share photos available with image editing tools. It is the best message application to use especially when you are traveling overseas using Wifi connection without the high cost. To create user profile, you can use the phone number to make free call, voice call, and messages. In addition, send video messages to each other or join the chat in group with other users. You will experience fun chatting that allows you to insert many emoticons into the chat. You will not face the difficulty to use this application since Wifi connection is mostly available in many countries. KakaoTalk is really fun with lots of useful features. The theme can also be customized using the image you like. It also allows you to change the wallpaper, font, chat bubbles, and many more. Furthermore, you will find winter theme using the latest version of KakaoTalk. You can have voice call in good quality and fast short message service. To use this message application for free calling, it is better for you to send message to person whom you are going to call. After knowing if that person is available, you can make request for a free call. It allows you to call your friend with better quality if you use earpiece when make a free call. You can also talk with friends up to five people at the same time in a chat room. Install this application and get ready to have new fun experience of sharing information with new people around the world. Now, please have fun with them using KakaoTalk for Android.